So ten days after the referendum and maybe we are recovering from the shock. The world has not stopped turning, the sun is shining at last and it seems clients are still buying property. But what of the future? There seems to be little disputing that leaving the EU will most likely adversely affect the economy, afterall post-war economic growth has been largely built on the back of free-trade. This may be a direct result of loss of access to markets or through a loss of confidence and consumers delaying or deciding against a particular purchasing decision. This is the mechanism which drives the cyclical nature of the economy. Confidence has a real impact. On the positive side a weaker pound will make our exports more competitive and more people will visit the UK on holiday (at least it will be cheaper for them to do so), we may be less likely to holiday abroad and this is good for our economy, especially in Bath and Bristol. The FTSE100 is higher now than it has been for some time although the FTSE250 is down significantly on recent months but it is still around 2015 levels. It is the FTSE250 which is more UK focused whereas the FTSE100 are mostly global corporations. If it is possible to negotiate a trade deal similar to that of Norway then we will still have access to the single market. The ‘cost’ of this is free movement and a financial cost not so different to what we are paying to be a full member of the EU. We have had only a small number of cancelled Surveys as a direct result of BREXIT however clients are keen to know how events might affect the Value of their proposed purchase. There is no evidence either way at present. Just uncertainty. Phone and internet enquiries have been very low in the past week. For the most part Valuations are as at the date of the inspection, a snap-shot in time. We have been given guidance from the RICS which includes paragraphs to highlight the fact that there are high levels of uncertainty at this time. My own opinion is that the property market is cyclical with periods of rising prices and falling prices and with an overall upward trend in the long term. This is shown in the diagram below. We have had several years of rising prices with growth which has far outstripped rises in earnings. Maybe BREXIT will mark the start of a period of reduced demand. We recently carried out a Survey and Valuation of a house in the Bedminster area, there were (apparently) 17 viewings and 10 offers over a weekend. It is hard to see that BREXIT will not help reduce demand but equally most buyers and many sellers would be happy enough to be in a more calm market, maybe a couple of offers over a period of several weeks. If property prices stop rising so fast or even fall a little is this a bad thing? Maybe not, afterall most sellers go onto buy so it is only down-sizers who would benefit or those inheriting a property. Rising property prices do however make us feel more wealthy and this gives us confidence to spend and hence the economy benefits. The opposite will be true for purchasers who find themselves with houses or flats worth less than what they paid or less than the mortgage. It is suggested that interests rates will be more likely to fall than rise at the time of writing and clearly this will also benefit many householders. Fortunately circumstances are very different from 2007 and the last down-turn when the housing market was so badly affected by the banking crises. Today the banks are in so much better financial shape with considerably greater reserves and we have not seen any real return of the doubtful lending criteria and practices which added to the problems back in 2007 / 8. 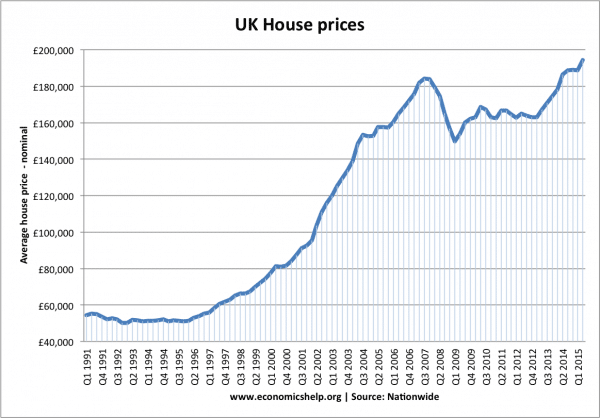 The diagram below shows the rate of house price inflation rather than the average price. Both these diagrams show that periods of falling house prices are short-lived.